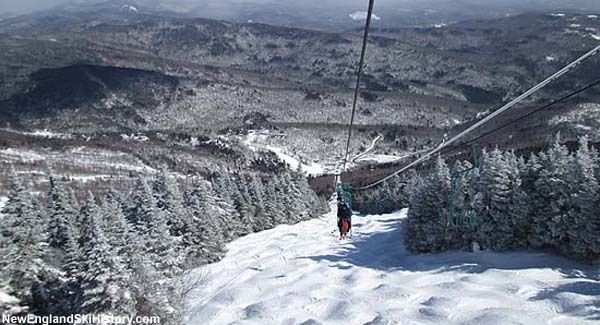 Located on the eastern face of General Stark Mountain, Mad River Glen is a well known "old school" ski area, famous for its unique terrain, single chairlift, and snowboarding ban. While serving in World War II, Roland Palmedo started thinking about developing a new ski area. Palmedo, a naval aviator, airline executive, and banker, had been instrumental in the growth of skiing, as he was involved in the founding of the Williams Outing Club, the US women's ski team, the National Ski Patrol, and Stowe's Mt. Mansfield Lift company. As the decade progressed, Palmedo was becoming frustrated with issues surrounding the ownership and direction of the increasingly glitzy ski area, feeling it was not capturing the essence he wanted. According to a biography written by his son Philip Palmedo, Roland "was chagrinned at how quickly success was spoiling the rural character of Stowe." Scouring maps, Palmedo's Mt. Mansfield Lift company colleagues J. Negley Cooke, Nancy Reynolds Cooke (US Womens Ski Champion), and Charlie Lord made site visits in his absence. Palmedo strongly considered developing a ski area on Mt. Abraham before discovering the characteristics of General Stark Mountain. Not only did the mountain have excellent snow retention characteristics, but the land was not encumbered by state ownership. In November 1946, Palmedo's group formed what would become the Mad River Corporation and acquired options on the land owned by Parker Young Lumber Company and Ward Lumber Company. Though Palmedo had hoped Mad River Glen would share a bus shuttle and combined lift ticket with Stowe, the vision was scuttled when a schism developed between the two areas. 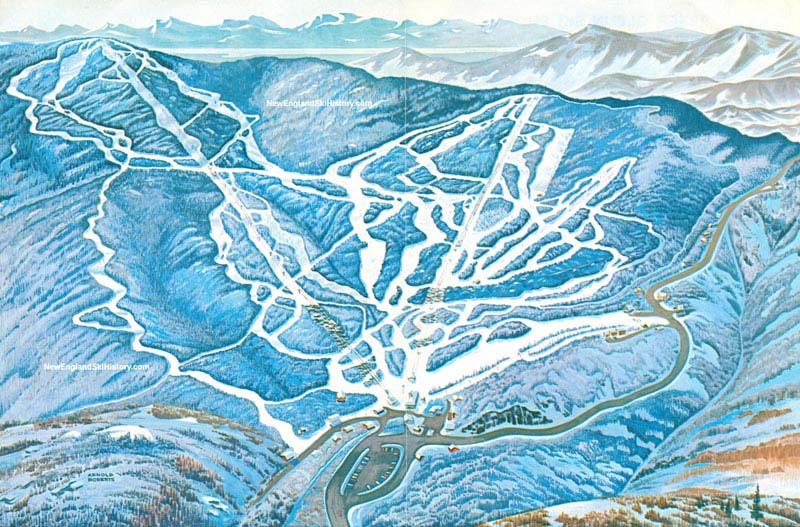 Like with his Stowe development, Palmedo planned Mad River Glen around a long single chairlift. Though trail clearing and lift construction commenced in 1947, financial issues and a late fall snowstorm put a 1947-48 opening out of reach. Additional investors were subsequently brought on board and lift construction completed in 1948, allowing for a December 11, 1948 dedication. Unfortunately, a lack of natural snow prevented skiers from riding the chairlift until January 1949. Initially managed by Charlie Lord and Howard Moody, Mad River Glen debuted with about half a dozen trails, the Base Box, and a Sig Buchmeyer ski shop for its debut season. According to the Boston Globe at the time, "the trail layout on the mountain is unique in that all start from the top and then regroup at the mid-station, where they again diverge and use different types of terrain to the bottom." Due in part to limited natural snowfall, the area finished its first season in the red. 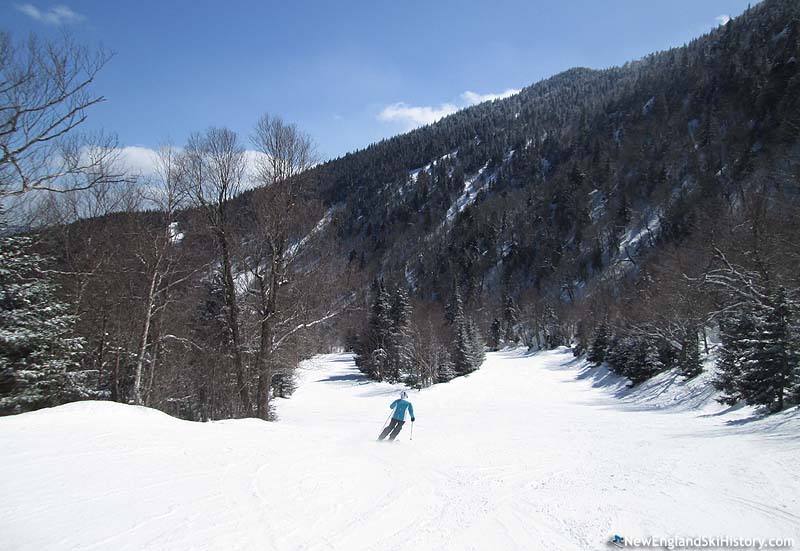 For its second season, Mad River Glen improved easier terrain from the top, as well as adding a novice rope tow slope. Once again a winter with subpar snowfall put the ski area in the red. 10th Mountain Division veteran and Mont De Luc General Manager Jack Murphy became General Manager of Mad River Glen for the 1952-53 season, recruiting friend Ken Quackenbush from North Creek to be his assistant. 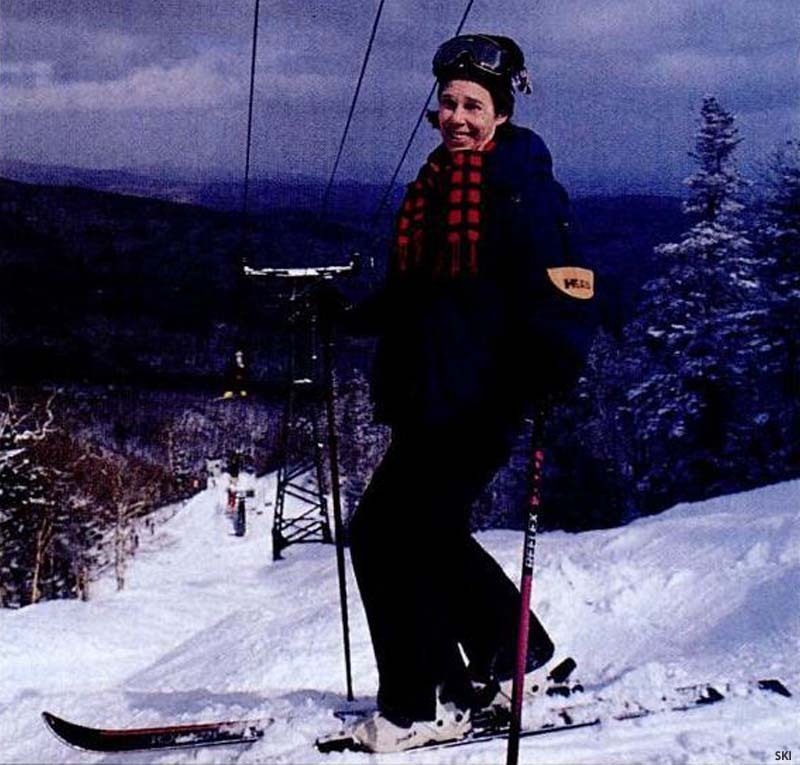 In 1953, Connecticut resident Betsy Stratton met a banker friend of Palmedo while skiing at Mad River Glen. She and Truxton Pratt married in 1954 and celebrated their honeymoon at the ski area. Circa 1957 Quackenbush took over as General Manager when Jack Murphy left to develop a new ski area down the road. Sugarbush opened for the 1958-59 season, while Mad River Glen installed a T-Bar on the Practice Slope. 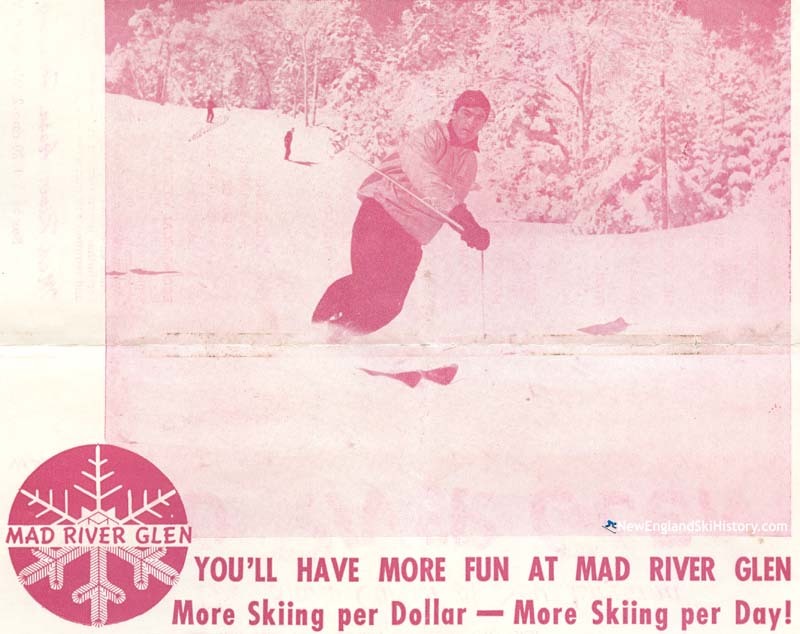 As the ski industry went into its major growth period, Mad River Glen did too. The Sunnyside complex opened for the 1961-62 season, giving Mad River Glen its second top to bottom lift, as well as some non-expert terrain. The Birdland complex, featuring novice and intermediate terrain, debuted for the 1966-67 season. In early 1972, real estate developer Bradford Swett and Truxton Pratt formed McCullough Corp. Circa early March, the company purchased 92% of Mad River Corp., making Swett President, Pratt Chairman of the Board, and General Manager Ken Quackenbush Vice President. 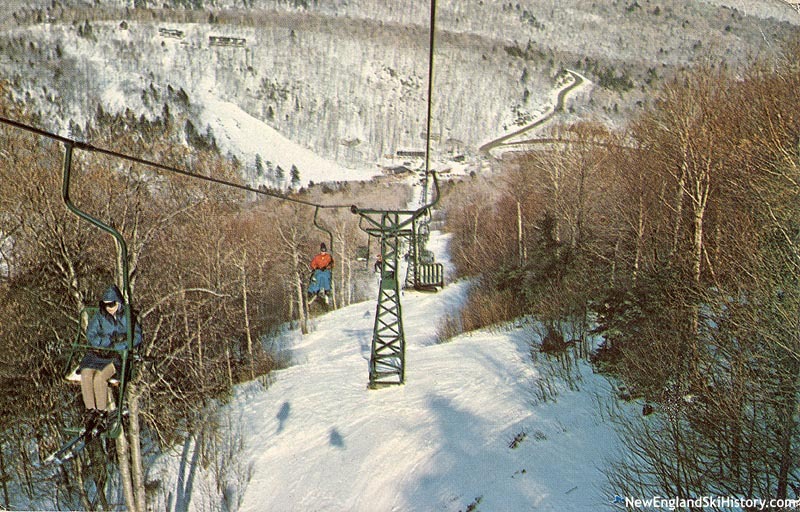 For the 1972-73 season, the Practice Slope Chair was installed, replacing a T-Bar. To date, this is the last net new chairlift installation at Mad River Glen. Snowmaking made its debut at Mad River Glen for the 1975-76 season, covering the Practice Slope. The mid 1970s proved to be a sad time at Mad River Glen, starting off with an accident on the single chairlift in February 1975. In July of that year, Truxton Pratt passed away at the young age of 49 after a long fight with cancer. Founder Roland Palmedo passed away in March of 1977, followed by J. Negley Cooke in 1978. Following her husband's death, Betsy Pratt took control of the ski area, eventually acquiring a principle stake. Reflecting years later, Pratt said, "I consider ownership to be stewardship." In 1984, Mad River Glen introduced its now famous 'Ski It If You Can' bumper sticker, emphasizing the character of the terrain, as well as the lack of snowmaking/grooming. Though snowboarding was allowed at Mad River Glen starting with the 1986-87 season, snowboarders were banned from the single chairlift due to deropements. After a confrontation between young snowboarders upset about the partial ban and Betsy Pratt, snowboarders were banned from the entire area starting in 1991-92. Meanwhile, circa the 1990-91 season, Pratt made known her intentions to sell the area, as well as her desire to keep it from being purchased by a corporate entity seeking to make it a destination resort. With Sugarbush bouncing from one corporate owner to another, the contrast was stark. On September 27, 1994, the Mad River Glen Cooperative was registered as an entity in the State of Vermont. After nearly a quarter of a century of ownership, Betsy Pratt entered into an agreement to sell the ski area to the cooperative in December of 1995, even buying a few shares herself and providing startup funds. Planning immediately began for long term improvements while retaining the character of the ski area, as snowmaking was prohibited above 2,300 feet in elevation. One core value was clear - snowboarding would not be allowed. In April of 1998, the coop sold its 1,667th share, raising enough money to own the ski area outright. Much needed lift improvements were about to begin. The Sunnyside chairlift was rebuilt for the 1998-99 season, dramatically extending its useful life. After the season, Robert Mazza stepped down as General Manager. Bob Ackland took over as General Manager for two seasons before departing to join a new ownership group at Sugarbush in 2001. His assistant Jamey Wimble took over as the next Mad River Glen General Manager. In April of 2007, the single chairlift carried its last skiers before shutting down for an unprecedented construction project. That off season, Doppelmayr-CTEC completed a $1.5 million renovation of the lift, including restoring towers and terminals while fabricating replica replacement chairs, sheaves, and bullwheels. The rebuilt lift was completed in the fall of 2007. Jamey Wimble stepped down as General Manager in September 2016. Matt Lillard, formerly of Eaglecrest, Magic, and Okemo, took over as General Manager in March 2017. The Mad River Glen Cooperative continues to sell shares to this day in lump sum and payment plan options, with well over 2,000 (of up to 3,000 allowed) sold to date. Concern about not operating during periods of poor snowfall has once again raised the question of whether or not to install a larger snowmaking system. For now, a meager snowmaking set up covers a small portion of the ski area, as Mad River Glen decidedly remains a natural snow skier's destination. "Spent nearly every Christmas week and winter break week skiing there throughout the 70's. Got real familiar with the 70's new england variety of snow. The kind you need sharp edges to ski on. I recall dad waving to Roland going up the single chair once. I think it was the time the single chair reopened after it slipped the cable that one time. We went up too and got exhausted plowing down the Chute through over a foot of powder that accumulated during that lift outage. Nearly every night after hours, we would sled down the hill on borrowed cafeteria trays and prank the rockefeller tramway and run off. Good times." "Skied The Glen regularly in the late 50`s for four years. Favorites were the Chute & Fall Line. Yes, 'Ski it if you can' and it was great. I remember skiing with Betsy Pratt in the 60`s. In the late 50s we would regularly leave skis and poles in the out-door rack returning to fetch them and ski the next day. Those were the days. And yes, I was at the bar as Gussie was first opening! Great memories of my favorite, General Stark Mt. and Mad river! Greetings to Betsy and all. Newt"
"I used to go to shaker mountain school out of Burlington and starksboro.Thanks to the ownership we were able to get lift tickets to Mad River glen on Thursdays for $1,this was in 77-78.What a good time we all had on the slopes.The climb up the mountain off of RT116 some mornings in those ole late 60s dodge vans was pretty rough.If anyone reading this remembers please write back,Thanks."